The Digital Research Library of Illinois History Journal™: Lost Towns of Illinois - Wabonsia, Illinois; Today's Fulton River District of Chicago. Lost Towns of Illinois - Wabonsia, Illinois; Today's Fulton River District of Chicago. 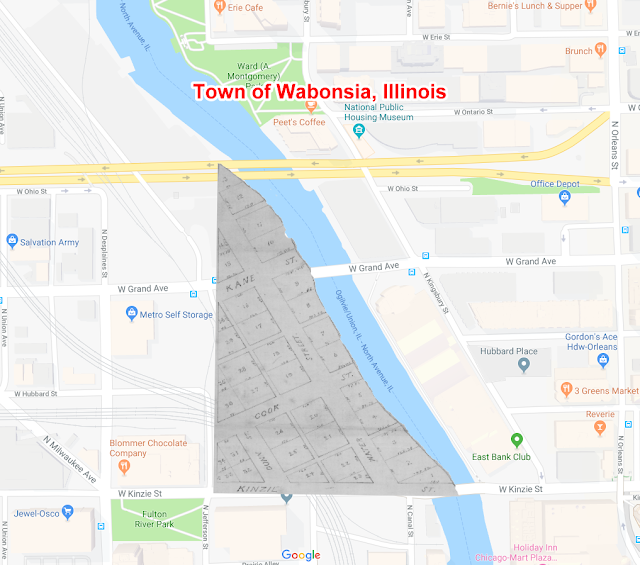 The land just west of the Chicago river and north of Wolf Point was once Wabonsia, Illinois, a separate legal entity from the town of Chicago growing to the south of the river. 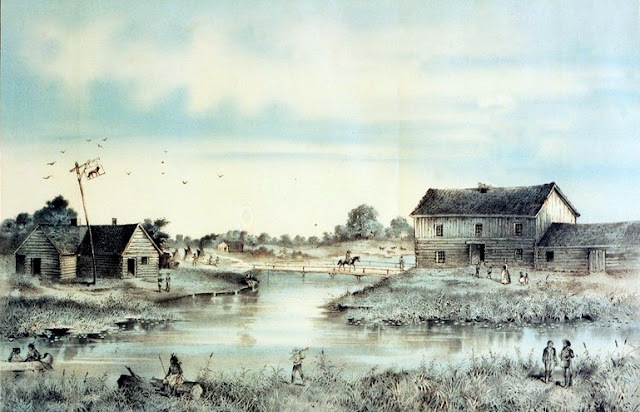 The drawing of an area dubbed Wabonsia, across the North Branch of the Chicago River from the new city, which had been incorporated two years earlier. Owned by another builder of early Chicago, John H Kinzie (son of John Kinzie), Wabonsia extended for a few blocks north of Kinzie Street, already named in 1835. Before that, there were cabins built here and there. Appearing on this 1835 plat map of the newly minted Town of Chicago, Kinzie’s Addition, “Wababsia,” a sliver of roads and river was its own separate town. Owned by John H. Kinzie (son) (Kinzie Street is named for his Father, John Kinzie ), Wabonsia became part of Chicago sometime between the Town of Chicago (1833) and the City of Chicago (1837). Wabonsia was bounded by Jefferson Street to the west and Kinzie Street to the south. The north branch of the river did and still does cut northwest making the third side of this triangular shaped town. Wabonsia was on a grid, like Chicago, but its grid cut northeast, askew from the town to the south and parallel with the river’s branch. Every single slanted street in the once-entity; Kane Street, Dunn Street, Cook Street, Water Street is long gone. In Juliette Augusta Magill Kinzie's (John H Kinzie's wife) 1856 memoirs “Wau-Bun, the Early Day in the Northwest," she recalls that her husband subdivided his land north of Chicago in early February of 1833 to make it more appealing for sale to the booming town of Chicago. The plat was corrected (changes unknown) in June 17, 1835 by surveyor J. Wooley then approved on August 26, 1835 by the Chicago Legislature. This would be the Town of Wabonsia’s birth. Wolf Tavern, Chicago’s first tavern, was owned by James Kinzie (the second son born to John Kinzie and his first wife Margaret Mckenzie Kinzie) and the namesake of Wolf Point, seemed to be just south of Wabonsia. A few old sketches of the tavern do show a wooden bridge to the north. The taverns at Wolf Point where the north and south branches of the Chicago River merged were typical of inns of the 1830s. The Wolf Tavern, with sign, is at left, while Miller’s Tavern sits on the riverbank at right. John H. Kinzie set aside this town to make it easier to sell the land to Chicago, not because he envisioned a community there. NOTE: "Wabansia Avenue" is named for Chief Waubonsie, who was an early 1800's Potawatomi leader and his brother Black Partridge or Black Pheasant who was also Potawatomi chieftain. He was very active in relationships between the Potawatomi and Fort Dearborn. Chief Waubonsie, whose name means "early dawn," was known for his peacemaking efforts.